MUMBAI: It was around 9 pm on a pleasant Mumbai evening and many well suited guests were waiting for the much awaited Blenders Pride Fashion Tour to begin. The audience was attending the event not only for designer Manish Arora who is admired for his work, but also for the eminent independent artists performing this year - including some like Raghu Dixit who were on the ramp for the first time. 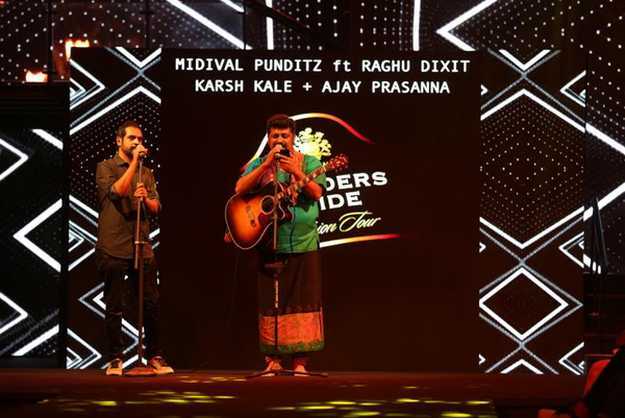 The world is aware about his unique style of presenting himself with his songs, but this time along, he was taking his brand a step ahead, by collaborating it with MIDIval Punditz and Karsh Kale, who have been associated with the designer and his shows for a much longer time now. Times are changing and with multiple doors opening for budding artists, the ones who are established are also looked upon as mentors. The artists make a valid point by saying that in a developing scenario today, only the performers who do not use the formula and don’t follow the normal trajectory are looked up to. We all are aware that growth is key for everyone’s career and that shall only happen if the musicians today get bored before the audience gets bored. Unfortunately, the only drawback is evolving, which makes us believe that experimentation and presenting different characters is missing.